The Test Driver Coordination System supports test drivers of IAV in the field by coordinating tasks efficiently. 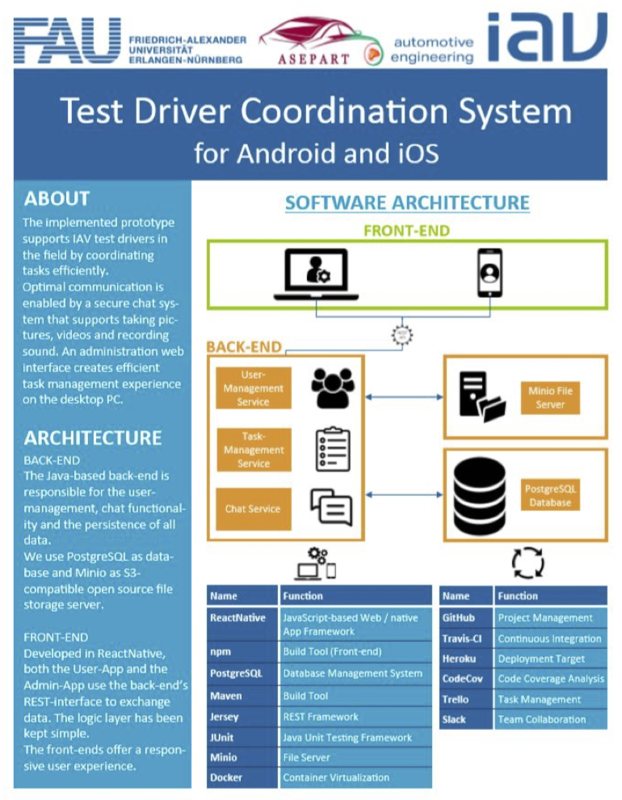 Test Drivers are supplied with a cross-platform mobile app where they can access information about their current tasks and submit their observations. An external administration web interface enables efficient task management experience for coordinators in the offices. Optimal communication between coordinators and test drivers is enabled by a user friendly and secure live chat system that also supports the most established media files (pdf, photos, videos, etc.). From the beginning, all team members were motivated and focused. By rewarding successful sprints with pizza, we managed to keep this attitude alive and finish 104 user stories with overall 358 story points. All the important planned features (see project mission) were finished until the deadline successfully.